The International Space Station's robotic Canadarm2 grapples the Leonardo Multi-purpose Logistics Module (MPLM) from the payload bay of the docked shuttle Discovery on April 8, 2010 during NASA's STS-131 mission. Earth's horizon and the blackness of space provide the backdrop for the scene. The Canadian-built Dextre maintenance robot is visible at bottom center. Thisstory was updated at 11:45 a.m. ET. 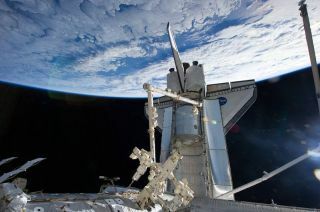 Astronautson International Space Station and shuttle Discovery tackled a mountain ofcargo delivery work early Saturday after getting an extra day added to theirmission due to an antenna failure. ?Mostof our day, a lot of us were involved in doing transfer, which is a lot likemoving,? teacher-turned-astronaut Dorothy ?Dottie? Metcalf-Lindenburger told Mission Control as the day wound down. Theshuttle astronauts are hauling 17,000 pounds (7,711 kg) of vital supplies,experiments and spare parts to the station. MissionControl decided Friday to extend their flight by one day, making it a now14-day flight, to give them more time to move the cargo and use the spacestation?s main antenna later to send home the results of a standard heat shieldinspection since their own shuttleantenna is broken. Discovery is now slated to land in Florida on April 19after a two-week flight. Spacestation flight director Ed Van Cise said the decision allows Discovery?s crewtime to inspect their heat shield without sacrificing any of their remainingmission goals. Those goals include two more spacewalks and moving nearly 8 tonsof cargo into the station while packing tons of trash and unneeded items up forthe tripback to Earth. Andthere?s another upside, Van Cise said. ?Itmeans that other crewmembers are available to do other things, and we?ve got alaundry list of activities that were normally planned to be done on the spacestation after Discovery left us,? he added. ?We can carry some of thoseforward, and having 13 people on board means we can get a few things done in afaster manner just by having more bodies available.? Thespace station is normally home to six astronauts, but its population leaped to13 people when Discovery arrived. Fourof the spaceflyers aboard are women. It?s the first time so many womenare in space together in spaceflight history. Two of the jointstation-shuttle crewmembers are Japanese ? another first, with Japancelebrating its most astronauts in space. Oneof those Japanese astronauts, first-time flyer Naoko Yamazaki, is in charge ofthe deliveries being made by Discovery and its crew. The spaceshuttle launched on Monday with an Italian module the size of a small buspacked inside its payload bay. Thecargo module, called Leonardo, was filled with spare parts, supplies and large,refrigerator-sized racks of science experiments. Five of those hulking racks,including a spare astronaut bedroom (to be converted into a bathing room),science sample freezer and other gear, were moved into to station earlier thismorning. ?Wehave to be very careful that we don?t hit any structure,? Yamazaki said of thebig moves. ?So we have to be slow and steady.? Oneof the big ticket items today is a science photography rack designed to cover ahigh-quality window in the space station?s U.S. Destiny laboratory. Calledthe Window Observational Research Facility (WORF), the rack serves as a sort ofdarkroom for astronauts and science instruments to observe the Earth withoutlight contamination from within the station itself. The result: Supposedlyultra-clear photos and precise observations of Earth. Eachof the racks weighs up to 2,000 pounds (907 kg), Van Cise said. ?Ifyou were doing it on Earth, it would be a pretty heavy, big deal. You?d needsome special equipment,? he added. ?They were doing it with fingertips andtheir toes.? Haulingheavy cargo is much easier when there?s no gravity to slow you down, he added. NASAroused Discovery?s crew Friday night with the song ?We Weren?t Born to Follow?by Bon Jovi, a tune selected for mission specialist Rick Mastracchio ? theflight?s chief spacewalker ? by his wife Candace and their three grownchildren. The shuttle astronauts are working an overnight shift while they flyin space. ?We?rehaving a great mission up here and I can?t wait to get back and see them,?Mastracchio said. Mastracchioand crewmate Clayton Anderson took a spacewalktogether on Friday to begin a lengthy ammonia tank replacement outside thespace station. The two astronauts will spend much of Saturday preparing fortheir mission?s second spacewalk ? a Sunday excursion ? to continue that tankswap chore. Inall, the liquid ammonia tank ? which feeds the $100 billion space station?scooling system ? will take three spacewalks to replace. The mission?s thirdspacewalk is scheduled for Tuesday. Theastronauts got some good news in their morning mail from Mission Control. NASAhas cleared Discovery?s heat shield of any damage concerns related to itslaunch. The late inspection will seek out any new damage from space junk ormicrometeorites while the shuttle has been in space. Discovery?sSTS-131 mission is one of NASA?s last few shuttle flights before the spaceagency retires the aging, three-orbiter fleet in September. Three more shuttlemissions are planned after this one.